The comforting flavors of your favorite holiday meal, without hours of cooking or cleaning your house for your zany relatives. Mountain House's Homestyle Turkey Dinner Casserole combines turkey, stuffing, harvest vegetables and familiar Thanksgiving spices in a savory broth. The comforting flavors of your favorite holiday meal, without hours of cooking or cleaning your house for your zany relatives. 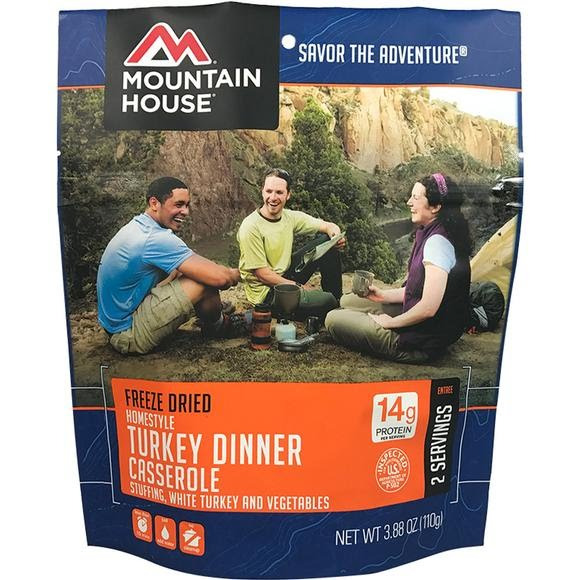 Mountain House&apos;s Homestyle Turkey Dinner Casserole combines turkey, stuffing, harvest vegetables and familiar Thanksgiving spices in a savory broth. With just-add-water simplicity, you can have your Thanksgiving day meal virtually anywhere - on the trail, at camp, or at the crag. INGREDIENTS: Stuffing: Whole grain wheat flour, enriched wheat flour (wheat flour, niacin, reduced iron, thiamine mononitrate, riboflavin, folic acid), sugar, sunflower oil, palm shortening, salt, yeast. Turkey Dinner*: Turkey (white meat turkey, salt, natural flavor), green beans, celery, carrot, turkey broth (turkey stock, natural flavor, salt, yeast extract, sugar), butter (sweet cream), corn starch, dehydrated onion, spice. *Freeze Dried. CONTAINS: Milk, Wheat.